Last year we only got snow a handful of times and although a few of those times were significant snowfalls, I don't recall it sticking around for very long. Not long enough to be old snow, at any rate. This season has been much snowier so far (which is a good thing for our reservoirs, I'm sure). 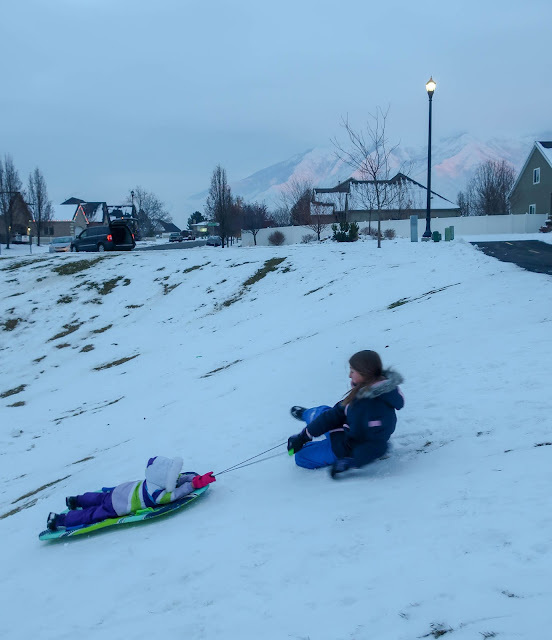 It snowed on Sunday and the kids went sledding because they simply couldn't resist the snowy hill calling their name, even on the Sabbath day. 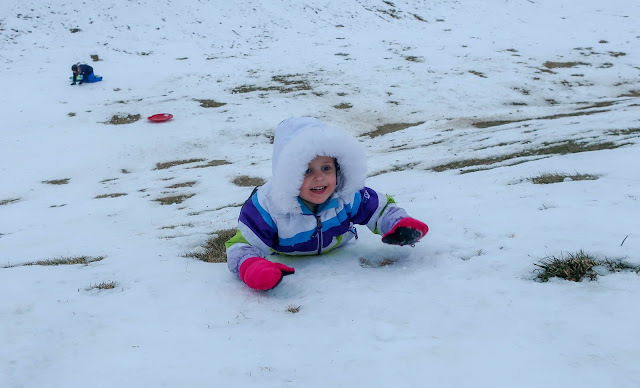 Rachel even broke out the phrases, "bonding time" and "wholesome recreational activity," and volunteered to take Benjamin and Zoë to the hill by herself. 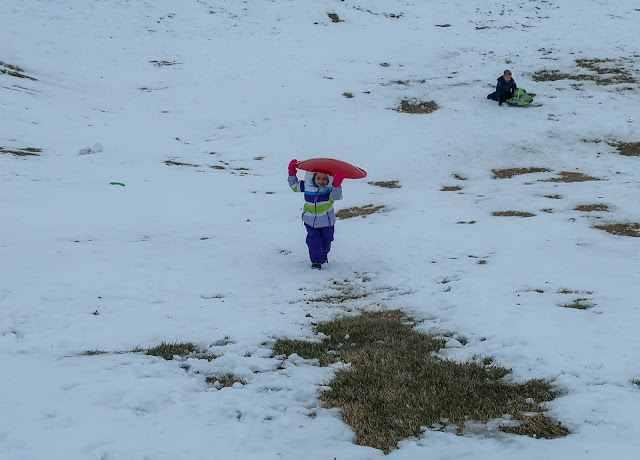 So, yes, we let them go sledding on a Sunday. And then we started our busy week and the snow sat and sat and sat, freezing and thawing and freezing and thawing but never quite melting because it didn't get warm enough for that this week. 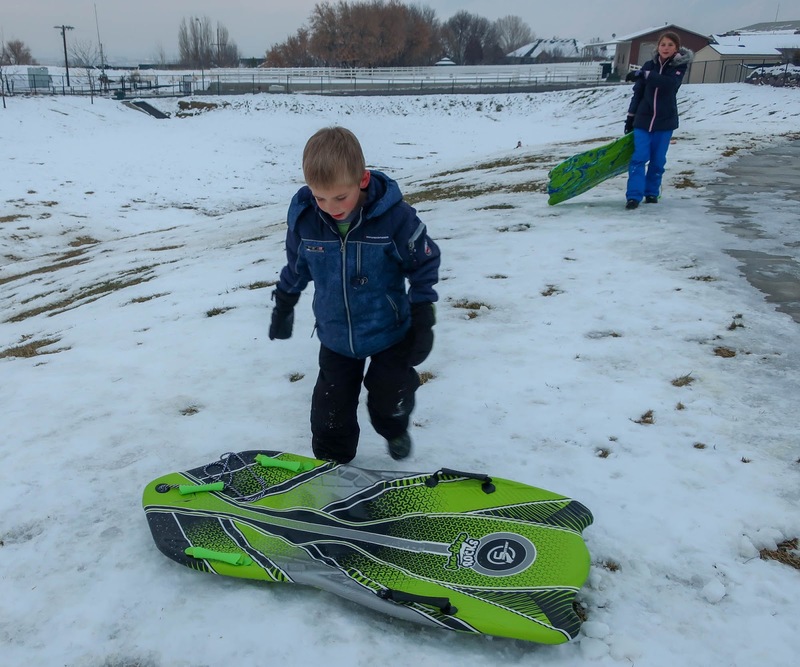 On Thursday we decided to go sledding again and the kids were pleasantly surprised at how awesome "old snow" is for sledding. They've never experienced "old snow" before. It's much more slippery than new snow, which makes sledding a much more slippery experience. They loved the going down parts of sledding. They did not like trying to climb back up the icy slope. Poor Zoë couldn't even manage it while carrying her sled so Rachel had to carry both their sleds up every time. 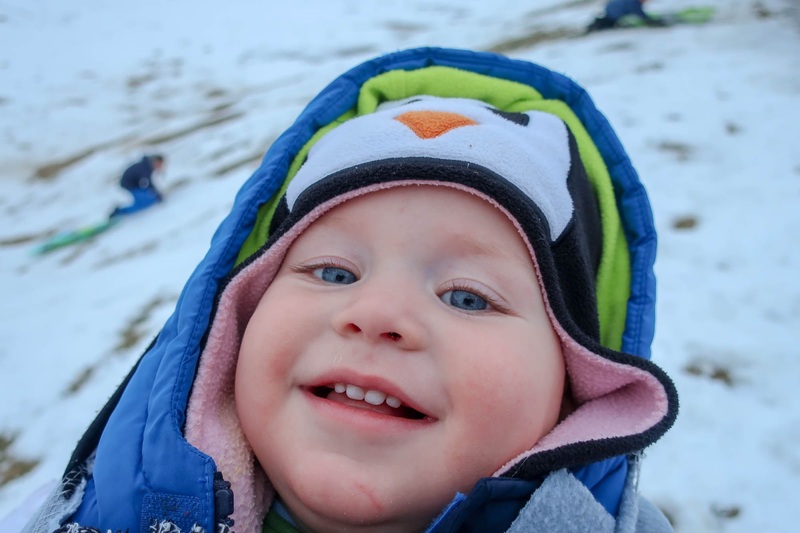 I didn't go sledding this time because I had Alexander strapped to my front and I didn't want to risk falling off a sled with him ("old snow" is much less forgiving in a fall than "new snow"). He was happy to watch with me. 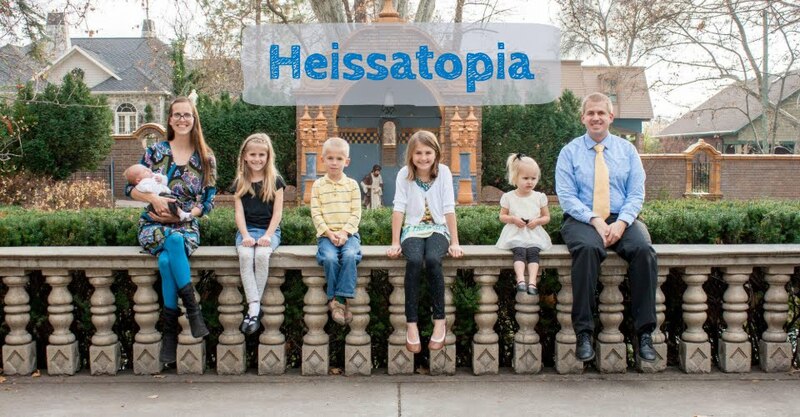 For the record, the kids have not been walking to school lately. Our neighbour around the corner asked if she could please give them a ride to school in the mornings because she feels guilty every time she drives past them, trudging to school in the cold, while her car sits half-empty on the way to school. So, they've been getting a ride each morning. They still pack their snow boots along for recess, however, and for the walk home (the afternoons are considerably warmer than the mornings) so that they can play in the snow. Poor Benjamin hit some ice on the way home from school the other day and fell down—all this freezing and thawing creates a lot of icy walkways. You just have to learn to tread carefully! There was no hope for treading carefully on the sledding hill, however. The kids were slipping and sliding all over the place and they had a blast doing it. 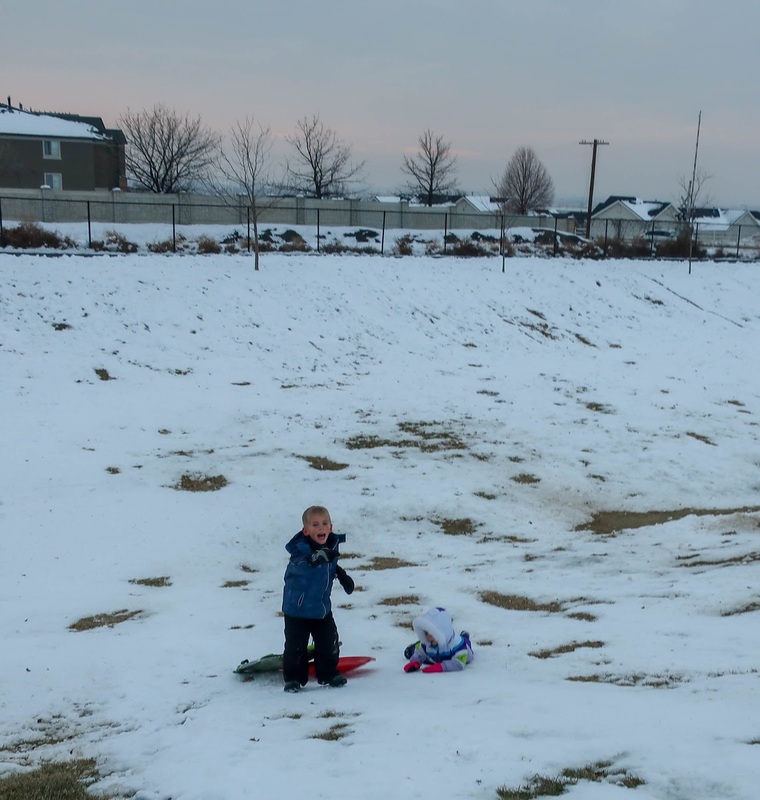 They hardly needed a sled to zoom down the hill; things were slippery enough without them! No one wanted to go home, but I eventually called it a day. It gets cold pretty fast once the sun sets!